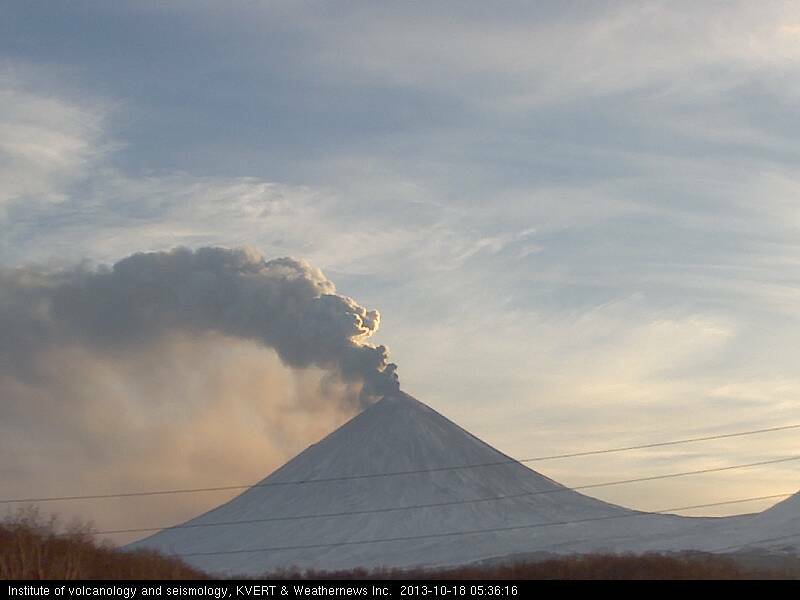 A moderately large ash plume of approx 3 km height has been rising to about 25,000 ft (7.5 km) altitude this morning. Shiveluch (Kamchatka): As if it was jealous of Klyuchevskoy, the other volcano currently in violent eruption, Shiveluch has increased its activity recently. Dome growth has gained speed again, producing more frequent avalanches as well as explosions. Several explosions occurred during the past 24 hours sending ash plumes to 20-23,000 ft (6-7 km) altitude and drifting east. A large SO2 plume, indicator of the arrival of fresh magma, can be seen on NOAA satellite data as well. Semeru (East Java, Indonesia): A pilot observed a small ash eruption this morning. The volcano had recently been very calm, but this could be a sign it is getting more active again. Dukono (Halmahera): Elevated explosive activity (strombolian to vulcanian type) continues. An explosion this morning produced an ash plume rising to 7,000 ft altitude. Veniaminof (Alaska Peninsula, USA): AVO has lowered the alert level to yellow, as it appears that no new eruptive activity has occurred during the past days. The eruption is not considered over yet, but might be simply pausing and could resume any time (such as the volcano did before). Popocatépetl (Central Mexico): Following a small increase in the frequency of small explosive emissions during the previous days, activity has now decreased again to averages of less than 1 emission per hour. At night, crater glow remains visible. Santa María / Santiaguito (Guatemala): The volcano is in its most typical state of activity. After a few days with less (recorded) activity, the volcano's lava dome has again produced a number of small to moderate explosions with ash plumes rising up to about 700 m yesterday. Glow was observed at the eastern rim of the Caliente dome, which suggests that slow lava extrusion has resumed there as well. Pacaya (Guatemala): Strombolian activity continues at low to moderate levels with little variations over the past days. Explosions with low ash content eject incandescent lava bombs to up to about 50 m above the rim of Mackenney crater. Fuego (Guatemala): Activity has decreased and shifted back to be mainly mildly explosive. INSIVUMEH reported a few explosions with ash plumes of about 300 m height yesterday. The lava effusion has decreased. The lava flow was still active yesterday morning, but only 150 m long.